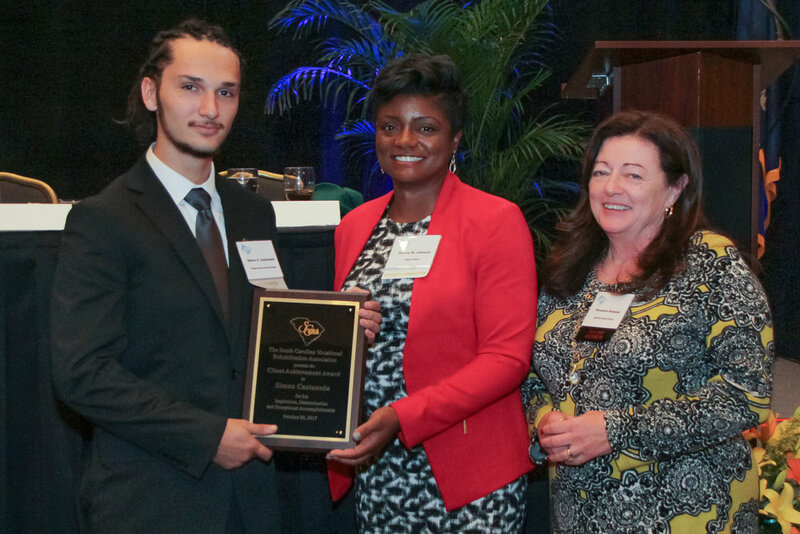 Simon Castaneda (left) receives the 2017 Client Achievement Award from Felicia Johnson, VR Interim Commissioner, and Dr. Roxzanne Breland (right), Chair of the SC State Agency of Vocational Rehabilitation. Simon Castaneda of Berkeley County received VR’s Client Achievement Award at the SC Vocational Rehabilitation Association (SCVRA) annual meeting on October 20, 2017. SCVRA is a support organization for the S.C. Vocational Rehabilitation Department (VR), which prepares and assists eligible South Carolinians with disabilities to achieve and maintain competitive employment. Entering his senior year of high school in 2015, Simon was having trouble concentrating, had low self-confidence and poor motivation. He had been diagnosed with attention-deficit/hyperactivity disorder (persistent inattention, hyperactivity, and sometimes impulsivity) and oppositional defiant disorder (a frequent and persistent pattern of anger, irritability, arguing, or defiance) when he was younger. He was also dealing with the sudden, unexpected loss of his mother three months before school began. As a result, he made the decision to withdraw from school. When he came to the Berkeley-Dorchester VR office, Simon was subdued and quiet, often staying to himself and avoiding interactions with other. Through counseling and guidance, job preparedness training, and the support of staff, Simon addressed these issues. During this time he also worked on completing his GED, with additional assistance from Palmetto Youth Connection and Adult Education. Through a partnership with Trident Technical College, the Berekely-Dorchester office offered a Certified Production Technician course. Simon was interested in manufacturing and, with his GED and a silver WorkKeys certificate, met the eligibility requirements. His counselor and business development specialist also helped him receive a scholarship for the training. At first, Simon had some difficulty, but with support from his counselor and the course instructors, he began utilizing the skills he had learned. He became involved in the study group, improved his confidence, and even began assisting the instructors with the training. (left to right) Dr. Roxzanne Breland (right), Chair of the SC State Agency of Vocational Rehabilitation; Felicia Johnson, VR Interim Commissioner; Wendy May, Job Preparedness Instructor; Lorna Manglona-Alexander, Career Specialist, Berkeley County School District (former VR Counselor); Michelle McDonald, Business Services Coordinator. Following the CPT course, Simon interviewed with CR Bard, Inc, a company in Moncks Corner that produces a variety of medical devices. He was hired as a production technician and works in an area where he helps manufacture catheters. Since his hire he has been promoted twice. VR staff members who assisted Simon in reaching his goals included Lorna Manglona-Alexander, Kim Van Deusen, Michelle McDonald, Rob Wiggins, Loleta Ravenell, Richard Kelly, Wendy May and Russell Woods. Watch the 2017 Client Achievement Award video. Tommy Pruitt, Human Resource Manager at Ruiz Foods, Inc., receives the the SCVRA Business Partnership Award from Dr. Roxzanne Breland (center), Chair of the SC State Agency of Vocational Rehabilitation, and Pam Company, Florence Area Supervisor. Ruiz Foods in Florence received VR’s Exemplary Employer award at the SCVRA annual meeting. Over the past two years Ruiz Foods has become a valuable VR partner who provides employment opportunities for VR clients. They have hired more than fifty VR clients who successfully completed the Manufacturing Certification Program provided by the Southeastern Institute of Manufacturing Technology at Florence Darlington Technical College. Ruiz Foods also participates in the Florence Area Open House, Disability Mentoring Day and often sponsors events. They share their experiences with VR services and successes with other businesses in the community. Watch the 2017 Exemplary Employer Award video. The following businesses were each honored at this year’s SC Vocational Rehabilitation Association (SCVRA) annual meeting. Each has been instrumental in providing training and employment opportunities for VR clients. Juana Slade (center), Chief Diversity Officer at AnMed, receives the SCVRA Business Partnership Award from Lisa Gillespie (left), Anderson Area Supervisor, and Ira Banks, SC State Agency of Vocational Rehabilitation Board Member. AnMed Health is a valued business partner of VR’s Anderson office and has been a host site for the internationally recognized Project SEARCH school-to-work transition program. Project SEARCH is a unique business-led model that includes a collaborative effort between school districts, VR and other partners. AnMed provides real-life work experience to help youth with significant disabilities successfully transition from school to adult life. The win-win partnership between AnMed Health and VR has resulted in ten VR clients being hired into career opportunities since the beginning of 2017. AnMed is truly a model of inclusion for businesses to follow. Jody Brazell (center), Co-owner of Roy’s Wood Products in Lugoff, receives the SCVRA Business Partnership Award from Summer Rigby (left), Camden Area Supervisor and Rhonda Presha, Vice Chair of the SC State Agency of Vocational Rehabilitation Board. Roy’s Wood Products partnered with VR’s Camden Training Center to develop a training curriculum that teaches specific skills required by their company. This partnership led to successful employment for five VR clients who have been hired into opportunities including finishers, assemblers, and material handlers. In addition to training for VR clients, Roy’s Wood Products has provided opportunities for students to learn about careers in custom cabinetry during VR’s Disability Mentoring Day. Wayne Sosin (second from left), President, and Erica Iwanowksi (right), Office Manager, of Worksman Cycles in Conway, receive the SCVRA Business Partnership Award from Joseph Thomas, SC State Agency of Vocational Rehabilitation Board Member, and Tania Appel, Conway Business Development Specialist. Worksman Cycles has hired more than ten VR clients into positions including assemblers, warehouse personnel, painters, and welders. The company often goes above and beyond by allowing students with disabilities to try a variety of jobs in order to find the right fit for them. To provide accommodations for a VR client who is Deaf, Worksman also modified the tasks of an administrative position. Tillette Scott, (right), Marlboro Area Supervisor, receives the Administrator of the Year award from the SCVRA Administrators’ Association from John Sandifer, SCVRAA President. Tillette Scott, Supervisor of the Marlboro VR Office, was named Administrator of the Year by the SCVRA Administrators’ Association. Scott supports the needs of clients and staff with empathy and understanding. Her hands-on approach to providing opportunities for clients and employers ensures that each receives the best and most appropriate services. She also helps her staff grow professionally. Tim Jones (left), Job Readiness Training Coordinator at VR’s Lexington Area Office, receives the Direct Client Service Division award from Kerry Reece, DCSD Treasurer. Tim Jones was honored as the Direct Client Services Division Employee of the Year. Jones exemplifies exceptional client service delivery in the knowledgeable, compassionate way he motivates and encourages clients to achieve their vocational goals. He is a Job Readiness Training Coordinator at VR’s Lexington Area Office. Myran Porterfield, Disability Determination Examiner at the Columbia regional office, received the Barry Cooper Award for Leadership for the quality of his work, his willingness to share his knowledge with others, mentoring trainees, and the energy and enthusiasm he brings to the office. Photo not available. Susan Vlahos, Disability Determination Office Trainer at VR’s Disability Determination Services (DDS) office in Greenville, received the Professional Staff Association Award for exhibiting the highest level of integrity, dedication, program knowledge and job performance. Joanie Hess (left), Administrator Coordinator, accepts the Technical Services Association Award from Niki Outen. Joanie Hess, Administrative Coordinator at VR’s State Office in West Columbia, received the Technical Services Association award. 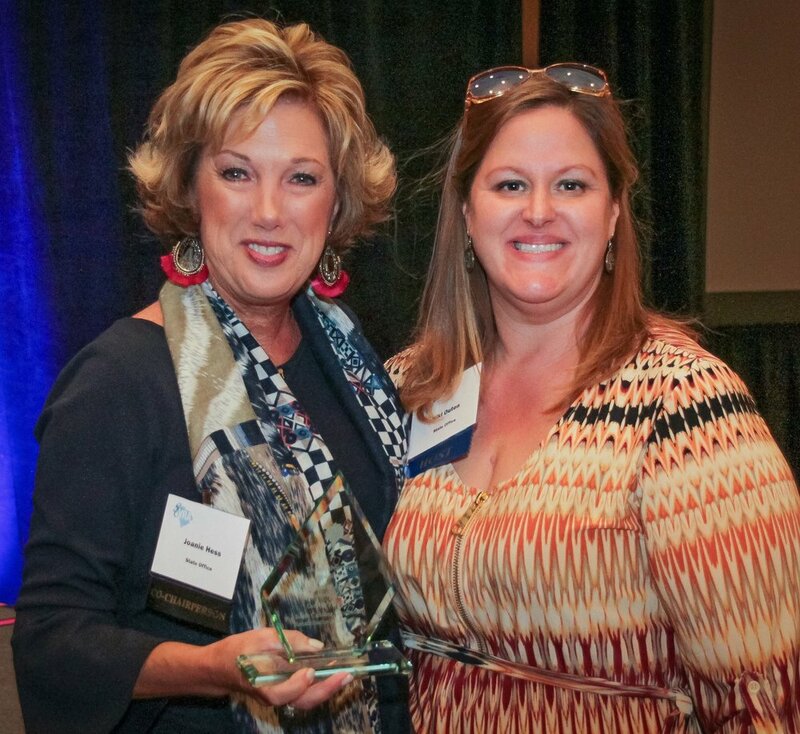 Hess was honored for her support of the success achieved by agency clients, in her current role as well as in previous roles in direct client service locations. She was cited for her expertise in planning, adaptability, loyalty, and focus on the individual, whether it was a client, staff member, or business/community partner. Debra C. Price (left), Ph.D, Disability Determination Lead Psychological Consultant, accepts the DDS Director’s Award from Shirley Jarrett, Director, Disability Determination Services. Debra C. Price, Ph.D, Disability Determination Lead Psychological Consultant at VR’s Disability Determination Services (DDS) office in Greenville, received the DDS Director’s Award. Price was honored for her contributions to DDS and NADE, the National Association of Disability Examiners, her in-depth knowledge and experience, exceptional people skills, positive attitude and unceasing drive for excellence in all areas. Pat G. Smith (left), Director of the Wil Lou Gray Opportunity School in West Columbia, receives the Richard M. Kuffel Excellence in Education Award from Laura Spears, VR Transition Services Coordinator. Pat G. Smith, Director of the Wil Lou Gray Opportunity School, received the Richard M. Kuffel Excellence in Education Award at the SCVRA annual meeting. Smith received the Richard M. Kuffel Excellence in Education Award for his commitment to providing quality support and services for youth, including those with disabilities. His goal for the school is to close the achievement gap in at-risk, undereducated youth ages 16-19 by providing them with the skills needed to achieve personal goals, develop leadership qualities, become productive citizens, contribute to local communities, and to respect themselves and others. Laura Spears (left), VR Transition Services Coordinator, receives the Richard M. Kuffel Excellence in Education Award from Anne Iriel, VR Assistant Commissioner. Laura Spears received the Richard M. Kuffel Excellence in Education Award at the SCVRA annual meeting. Spears received the Richard M. Kuffel Excellence in Education Award for the compassion, kindness, knowledge, and dedication she has shown to services for youth at VR. She always puts youth at the forefront and consistently supports staff through mentoring and training. She has helped develop and improve services and partnerships throughout the state to help students move toward meaningful competitive employment.